Darrin Kirkland Jr. committed to the Michigan on Sunday afternoon. Kirkland Jr. had been visiting Ann Arbor since Saturday afternoon with his family and decided to pull the trigger to become Michigans 7th recruit for the 2015 season. Last Years Stats: 108 Tackles, 7.5 Sacks, 2 Forced Fumbles, 2 Fumble Recoveries, 1 Interception. "They said I'll play the same position as Jake Ryan, a MIKE, but they might see me at WILL in blazing situations but I'll settle in as the leader and the MIKE." Kirkland is a defensive coaches dream. He has perfect size, athleticism, and football IQ to lead a defense. To get accustomed to college ball, it makes perfect sense to have the coaching staff start him out in a WILL position. Kirkland Jr. will lead this defense at some point in his career, but it dosen't have to start from Day 1. Darrin has a unique skill set were he can do pretty much do it all on the field; rush the quarterback, play man/zone coverage, and stop the run. One of Darrin's best attributes is that he attacks the ball quickly and runs through the person being tackled. Darrin will also take on a recruiting role with the team. 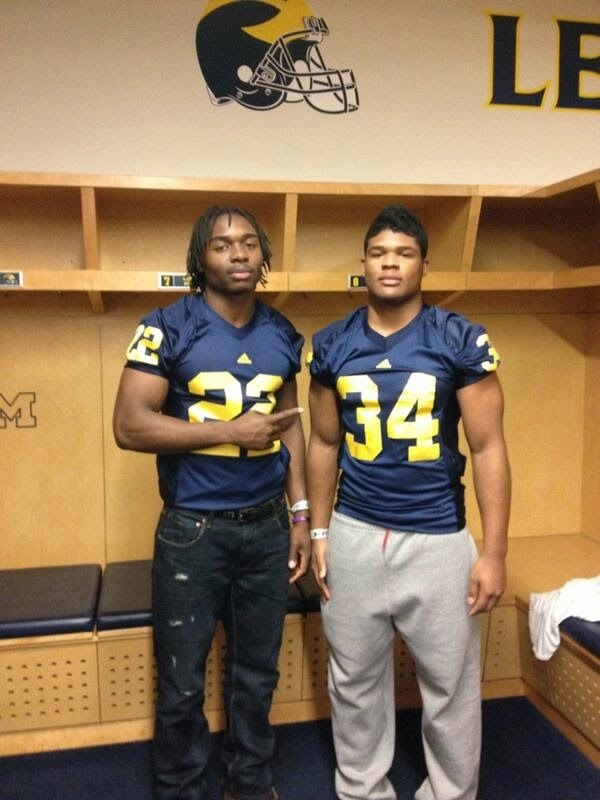 It's wide known that Darrin and 2015 LB Asmar Bilal are good friends and it just so happens Michigan would like to take more than one linebacker for the 2015 cycle. If the coaching staff can't land Bilal, then theres always Osa Masina, Justin Hilliard, or Joshua Mcmillan who have all expressed interest in the Wolverines. Darrin hasn't even been a commit for 24 hours and he's already started working on 2015 DE Keisean Lucier-South. Darrin becomes the 7th member of the 2015 recruiting cycle joining QB Alex Malzone, CB's Shaun Crawford, Garret Taylor, OT Jon Runyan Jr., K Andrew David and S Tyree Kinnel. Michigan is starting to put together a good looking class so far with four 4 star commits, and two 3 star according to Rivals. I don't foresee Kirkland Jr. being redshirted his first season as a Wolverine. With Darrins skills, he can be used in special team situations, and because of his speed can be used as a WILL line backer on third downs starting his first day. With 2 commitments in the past week, Michigans recruiting could be starting to gain momentum. They've put themselves in the drivers seat for a lot of quality prospects and could see more commitments in the near future.